Managing vacation property owners and guests requires personal service at it’s best. Well, we just completed another successful summer vacation rental season and goodness gracious were we busy! Every one of our rental homes were booked solid from Memorial Day to Labor Day. Not only that, but September was 75% booked and October is 50% booked. We’re currently accepting reservations for 2015 and already starting to receive inquiries. And we continue to learn, that managing vacation property owners and guests requires personal service at it’s best. Being fully booked is great of course but with so many guests checking in and out of our vacation homes each week it gives us some “opportunities” along the way that needed our attention. For example, in mid July one of our properties lost all it’s air conditioning due to a refrigerant leak in it’s HVAC system. Luckily it was on a Saturday between guests and our expert HVAC contractor took care of it right away. We had another situation where one of our home rentals in Carolina Beach had a clogged condensate line and it caused water to drip from the ceiling of the floor below. That was quickly fixed and we then had the ceiling repaired asap. Parking issues, clogged toilets, trouble with figuring out all the TV remotes and Wi-Fi – these are just some of the opportunities we handled to ensure our guests were happy and our homes were properly maintained. We started our company because we saw a gap in the service being provided to some homeowners who rent their properties out. Many of them don’t live in the area and told us they weren’t getting the attention and communication from their current rental management company they thought they deserved. Their vacation rental bookings were OK, most of the summer and some off-season, but they feel like they were being treated as a number, not as a person or as a client. We decided to focus first and foremost on our clients – the vacation home property owners. It starts with providing them with a high level of personal customer service. We keep them informed all along the way and work hard on upkeep, maintenance, and cleaning of their home. That is why we decided to name our company A1 Property Management instead of A1 Rental Management. The homeowner and their property always come first with us. Vacation guests tell me all the time: ‘David, we want a nice home to rent with attractive décor that doesn’t still look like 1985, and is clean’. I don’t think that’s too much to ask for when you’re spending your hard earned money to take your family to the beach on vacation for a week. I’m not saying every one of the homes I manage are completely renovated with granite, tile backsplash, and stainless steel appliances but I will say that they are all attractively decorated and clean as a whistle. We work very closely with our cleaners to be sure no detail is neglected. My cleaners are great to work with – Executive Cleaning. Mike and Tammy take a lot of pride in what they do and it shows. And it’s the little things that make a difference. For example: cleaning off the outside deck furniture, vacuuming up the sand outside the front door for a great first impression, cleaning the HVAC return. These are just some of the examples of attention to detail. If they see something we need to address, they are not afraid to speak up. They know that I want to know these things. And conversely, if I go in behind them and see something I believe still needs to be cleaned, I call them right away. You can say I’m a bit OCD but I’d take that as a compliment! The guest departs your home in good order. If there is anything that is broken or missing we inform them right away, especially if we will be charging them. Guests sometimes rearrange the furniture to better fit their needs for the week. We put back anything that was moved around. We check the Wi-Fi and TV’s to be sure they are all still working properly. You’d be surprised at how often a renter changes the inputs. Your home is cleaned by our great cleaning teams. They also keep an eye out for anything that may need our attention and tell us right away. Restock all the household supplies. The last thing a renter wants after a long drive here is to have to go to the store and buy basic household supplies. We want them to to relax when they arrive. For the most part our guests have been excellent to deal with and have treated our homes as though they were their own. It’s uncommon to have to call a renter and charge them for broken items as each guest renter is required to purchase a damage protection policy or put down a hefty security deposit. We want to be sure our clients, the homeowners, are protected. If a guest renter accidentally breaks a lamp, spills coffee on the sofa, or damages any furniture, we promptly file a claim with the damage protection company and get the item repaired or replaced. The only time we've have had to charge a renter’s credit card is for items damaged on purpose. The only other instance where a homeowner had to be charged to replace an item was when the wind knocked over a glass patio table and the glass smashed. That was not the renter’s fault, that was an act of God. We immediately replaced the table with a PVC patio set so that won’t happen again! Upkeep and repairs are very important to us here at A1 Property Management. Our homeowners rely on us to not only be their Rental Manager and keep their homes rented, they rely on us to keep their home maintained to high standards. We’re constantly in and out of their homes every time a renter checks in or out to look around and see what requires our attention. We believe that by being proactive we can save out homeowner’s money by doing the repairs and upkeep right away. We take the big picture view of the whole property. We didn’t want to just handle renters and pass along all the maintenance and upkeep issues to the homeowner. We do it all. And our homeowners love it. We put a lot of time, energy, and money into finding and keeping great renters. It all starts with a great website and we believe we have one of the best. Potential renters can easily search our properties, get quotes, review our rental agreement and book on-line with their credit card. We also send out mailings periodically to all of our past guests letting them know of festivals, events, and any discounts we are offering. We let guests who have stayed with us in the past know when we take on a new vacation home and hope to get them excited to rent it out. We get so may inquiries that we’ve been able to book very during the well off-season, as well as being fully booked all summer. Then, by providing a well-maintained clean property, we tend to get a lot of repeat guests. Renters who return tend to feel as though your home is their second home and treat it better. We offer discounts for repeat renters and constantly follow up with them in the hopes of seeing them again and again. We’re not saying we never mess up but we try really hard and care. We believe in listening to and sharing criticism, both positive and negative. When we get a comment from a renter, good or bad, we communicate it to the homeowner unfiltered. It doesn’t do us or them any good to sweep problems under the rug and if we have to take our lumps, we do. A few weeks back a renter emailed us stating that they had two issues with a home: 1.) One of the fry pans was encrusted and gross and 2.) There was a filthy dishrag sitting in the washing machine. We forwarded the email directly to the owner, apologized to the renter, and corrected both issues asap. My homeowner went even further by asking me to mail the guest a note and Starbucks gift card, courtesy of them. If that isn’t standing up and taking full responsibility, I don’t know what is. I enjoy working as a team with all my homeowners, whether they own a large oceanfront vacation home or a small oceanview condo in Kure Beach, we treat every client owner the same. We set a high standard, hold ourselves accountable, and go the extra mile to ensure we did all we could to resolve any issues with both the renter and the homeowner. Perhaps it’s because I’m an Eagle Scout (I’d certainly like to think so) that I take such a hands on approach to personally manage all of homeowner’s properties. 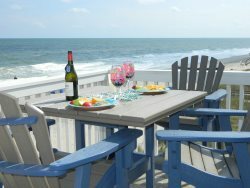 I’ve seen and been in a lot of home rentals on Carolina Beach and Kure Beach and know there is quite a range of décor, cleanliness, and personal upkeep available for guests to choose from. I like to work with property owners who care about their beach home. If they want to work with someone who will treat their home like it were their own - someone who is in constant communication, good or bad, and is successful at getting a high number of quality guests. A1 Property Management can help. If you’re considering hiring a Property Manager for the first time or are looking to perhaps change management companies we’d like the opportunity to compete for your business. We live on the island and can be available just about anytime to sit down and meet face to face or talk on the phone. As we’re already starting to accept reservations for 2015, now is the time to get started. We hope you will give us a call!